The Sat Naam Service Network is a group of like-minded individuals and businesses who will be actively supporting the reduction of stress and improving self-esteem through yoga and other healing modalities for the betterment of our community. We are looking for dynamic volunteers who are interested in dedicating their time, expertise, supplies and/or funds to help Sat Naam fulfill its mission. This includes supporting the Yoga In Schools Program which currently serves over 5,000 students as well as developing new programming that will be offered to students and educators. Fundraiser dates are available on a rolling basis. If you are interested in this unique opportunity, please contact us. Want to know what the Sat Naam Service Network looks like? Get the details about our recent community fundraiser with our friends Be A Light L.A. at Yoga Works. 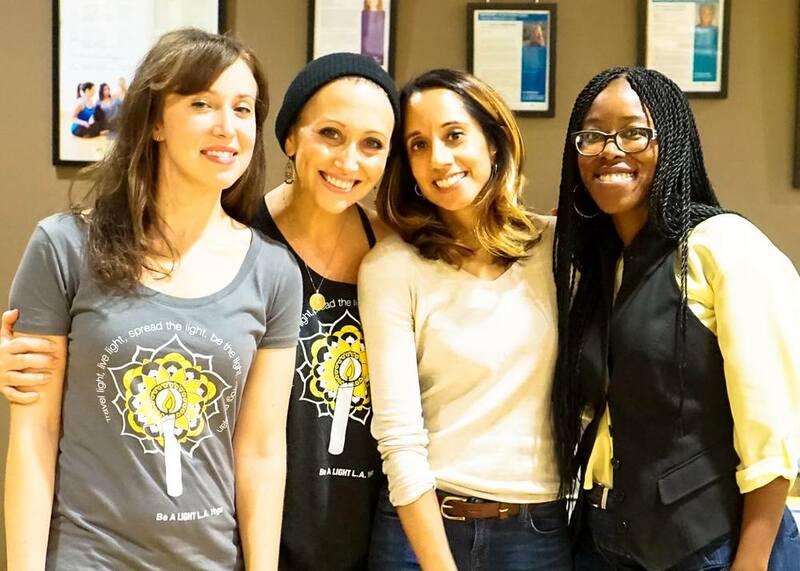 From left to right: Event Organizer Dania Alisa, YogaWorks Teacher Lainie Devina, Sat Naam Founder Seema Kapur, and Sat Naam Program Director Cecilia Ussher.